Inspiration is everywhere for the DIY decorator! Here are a few easy and attainable looks we found on Houzz, with an eye toward the wood picture frames, of course. The simplicity of this black picture frame montage does not equal boring. Notice the subtle differences between the main image over the sofa, and the gallery wall around the corner. This look is unified by the black borders but made interesting by the use of different shapes, textures and finishes on the frames themselves. The larger shape and bolder grain of the central piece make the frame cohesive with the art image. 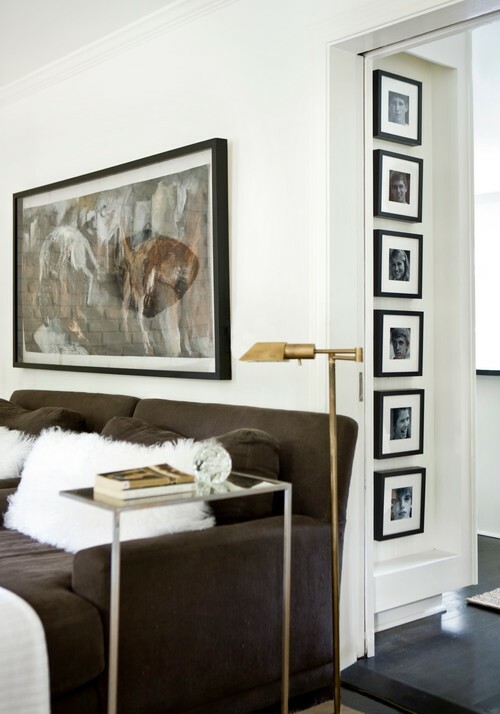 Just around the corner on the gallery wall, the smaller profile and matte finish on the frames along with the black & white photography unifies the decor without competing with the main work of art. Get this look by combining Infinity 51407 or Natural Hardwoods 206 with Basics AF 104 or L989 . 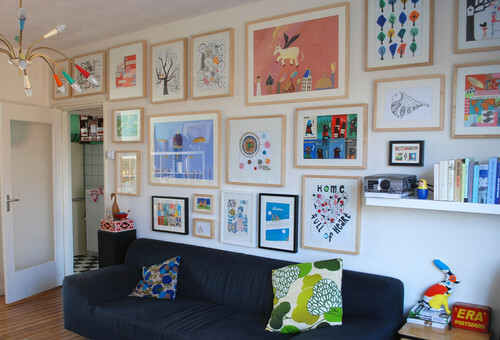 What is more delightful than a wall full of children's art? Talk about a happy place! Here, light maple tones rule with a few black and one white incorporated, keeping the display light playful and uncluttered. The use of a single white mat (where mats are used) also offers a bit of sophistication to the grouping. Get this look by combining Basics AF206 Maple, W1212 or W2112 Natural, 206 American Hardwoods Maple, AF 152 or L1192 White, and AF104 or L989 Black. Do not be afraid to mix and match picture frame styles! This cozy living space is made even more personal and inviting with a montage of family photos in several moldings and finishes. The frames reflect the materials and tones seen in the furnishings, unified once again with a single white mat board. Get this look by combining any frames from Econowoods and Basics lines . Just make sure you blend the styles of the frames with the feeling of your decor.